The Drake Middle School gymnasium was busy this summer. While many think that schools “take a break” when school’s not in session, that certainly wasn’t the case at Drake as 21 Auburn special education students, under the leadership of SERC Clinical Faculty member Kelly Schweck, spent the month of June working with adolescent and adult campers at the Therapeutic Summer Camp. Hosted by the City of Auburn and the Exceptional Outreach Organization, the camp is in its eighth year. This year, there were approximately 60 campers with a variety of disabilities. 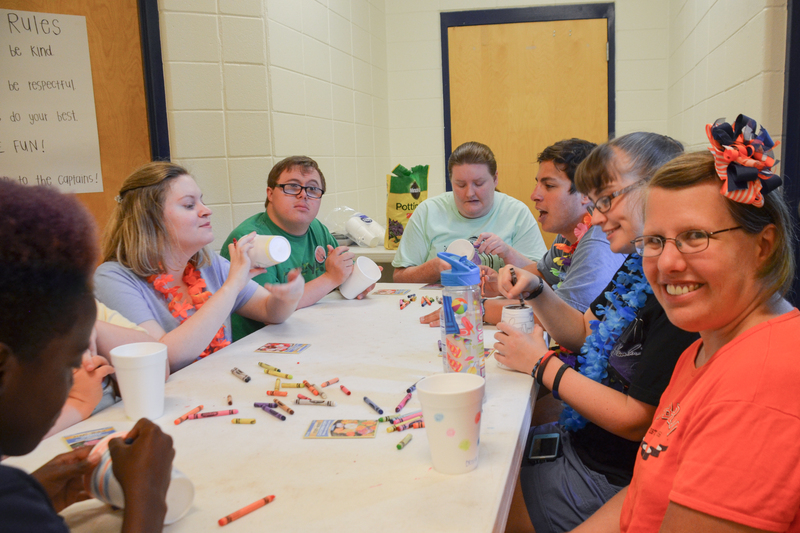 The camp gives Auburn’s special ed students, both undergraduate and graduate, a chance to get hands-on experience outside of a traditional classroom. Schweck also noted that her students benefit from seeing the campers in a non-school setting. It’s a great experience that prepares them for school but also allows the students to get to know the campers as people. Jessica Harris worked at the Therapeutic Camp and made many of the same observations as Schweck. Mary ‘Reenie’ Laginess, a Collaborative Special Education graduate, also discussed what she called the “unparalleled” opportunities provided by the camp. Schweck noted that the camp is also a valuable respite resource for families, and that the camp tuition is remarkably affordable. She said the campers are always excited about the session and talk about it throughout the year. There is a waiting list every year.